Crocodilians appeared many years ago during the time of the dinosaurs. The crocodilians are a group of large reptiles that includes alligators, crocodiles and gharials. The biggest crocodilian in the world is also the world’s biggest reptile, the Saltwater Crocodile. Crocodilians have a flexible “flat-on-the-stomach” posture. To walk, they hold their legs more directly underneath them to perform a “high walk”. The posture makes it easy for the crocodilians to gallop on land if they need to. Crocodilians are cold blooded creatures. They are found in hot tropical places around the world. All crocodilians have teeth set in bony sockets, like humans. But they are more fortunate than us because their teeth are frequently being replaced throughout their life. Young crocodilians replace teeth with larger ones at a rate as high as one new tooth per socket every month. When they are adult the teeth are replaced at a slower rate, only about once every 2 years or even longer. When they are very old, they eventually stop getting new teeth, so they will be toothless old crocodilians. One crocodile or alligator will go through at least 3000 teeth in its life time. Each tooth is hollow. The new tooth is growing inside the old one. Having this kind of nature, it allows a new tooth to come out as soon as the old tooth is broken. Crocodilians have a secondary area in their mouths that allows them to breathe even when they have a mouthful of water. They have extra nostrils in the back of their throat, where a special part of the tongue called the “palatal valve” closes so that they will not choke or drown when they open their mouth underwater. Crocodiles and gharials have modified salt glands on their tongue which are used to get rid of excess salt from their body. Alligators and caimans have the salt glands too, but unfortunately they don’t work. That is why alligators strongly prefer freshwater but the crocodile prefers seawater. Crocodilians tends to open their mouth when they are relaxing. We called that behaviour “gaping”. They do that to keep themselves cool on hot days. But sometimes at night when it is raining, they open their mouth too. Maybe gaping means something to their relatives and friends. Crocodilian males are territorial animals, just like male Komodo dragons. They protect their territory ferociously from other male intruders. 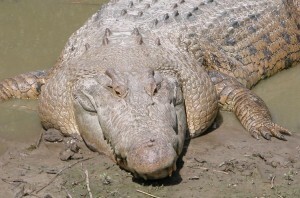 A mother crocodilian lays about 50-80 eggs in a nest on the land. She makes her nest near a river. The nest is built out of leaves, mud or other vegetation. These leaves keep the eggs warm and moist. The mother takes care of the baby crocodilians after they have hatched. She will be there for them until they are big enough to protect themselves. In many species of crocodilians, the mother carries her babies in her mouth! I wouldn’t want to ride in the mouth of a hungry alligator! These babies crocodilians feed on crabs, shrimps and insects. Don’t ever go near a crocodilian during nesting period. They are very protective of their eggs and extremely ferocious! If the nest temperature is 30C (86F), the baby crocodilian will be a female crocodilian and if the temperature is above 34C (93F), there will be lots of male crocodilians. Crocodilians maintain their body temperature at an optimum temperature by basking in the sun when the weather is cool and resting in the shade when the weather is hot. Crocodilians have a relatively small brain but it is more advanced than other cold blooded animals. Crocodilians see well during the day and they may even have colour vision. They have a vertical, cat-like pupil which gives them great night vision. However, they are not able to see well under the water because they cannot focus when they are under water. Their eardrums are behind the eyes and are covered by a movable flap of skin. The flap, nostrils and eyes will close when they dive, to stop the water from getting in. Crocodilians are able to respond to the slightest movement in the surface of the water. Therefore, they are able to locate their prey and avoid their predators even in pitch darkness. Their skin is covered with scales which are shed individually. They have long snout muscular tail and streamlined body. Their eyes and nostrils are located on top of the head, so that they can stay almost completely underwater and not be seen as they wait patiently for their dinner to come towards them. They have super strong jaws. They do not chew their food – They swallow it in large chunks like a snake. They are meat eaters. They eat birds, small mammals and fish. Alligators have a wider snout. 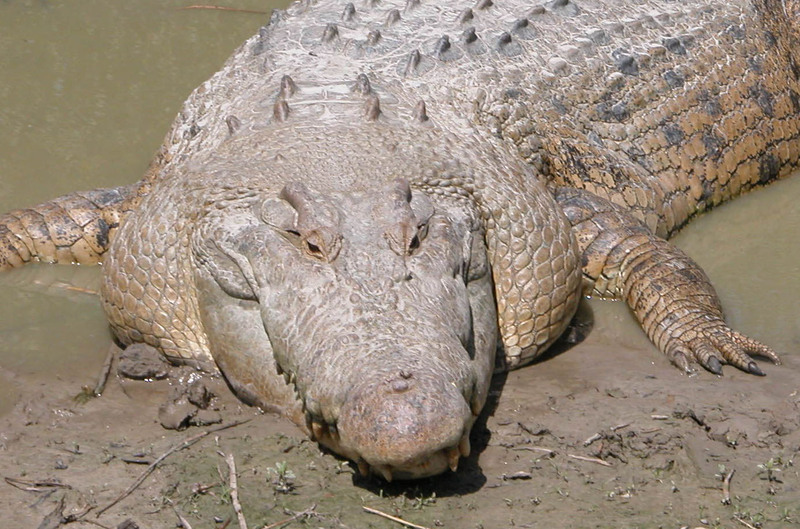 Crocodiles have longer, narrower snouts than alligators. The alligator’s upper jaw is wider than its lower jaw, and the teeth in the lower jaw fit into small depressions in the upper jaw. The upper and lower jaws of the crocodiles are the same width and the teeth on the lower jaw fall outside the upper jaw when they close their mouth. That is why the large teeth on the bottom jaw are exposed in a crocodile but are hidden in the alligator. 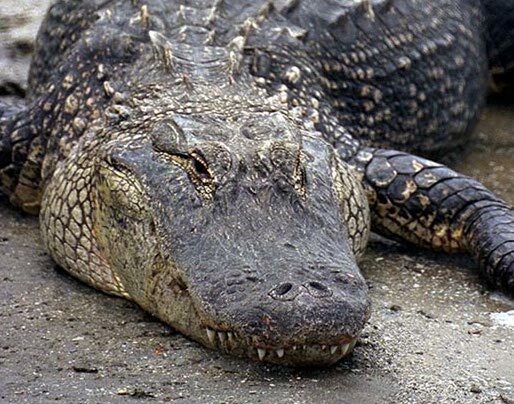 Alligators tend to be darker in colour than crocodiles. Alligators are almost black. Crocodiles are more aggressive than alligators. Ghairuls have a very thin snout.